Any Christmas song that talks about angels is a favorite of mine. This song is no exception for me. 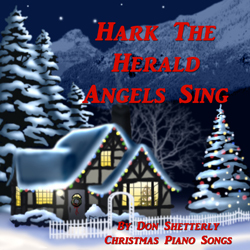 Hark The Herald Angels Sing is a beautiful Christmas carol that I knew had to be on this CD of songs. It is a fun and exciting song to play with an excellent message to go along with it. It is a very energetic song with joy and adoration for the newborn king, Jesus. Track #8 of 15 songs on Christmas Piano. The As Charles Wesley walked to church one morning in 1730, he wrote the words of Hark The Herald Angels Sing. An organist by the name of Waltham Abbey, set the words to music and it was finally published in 1856. The current day song that we know was a result of the work of not only Charles Wesley but George Whitfield, Felix Mendessohn and W.H. Cummings. Come, desire of nations come, Fix in us thy humble home. Pleased as man with men to dwell; Jesus, our Emmanuel! Hail, the heaven born Prince Of Peace, Hail, the sun of righteousness!